"Beauty is in fact bone deep"
The facial skeleton is the foundation of our appearance. This is evident in individuals blessed with prominent facial features such as a strong supraorbital ridge (the part of the bone under the brow), prominent cheeks and a strong jaw line. Because of the good skeletal support for the facial soft tissues, these individuals look good and age well. 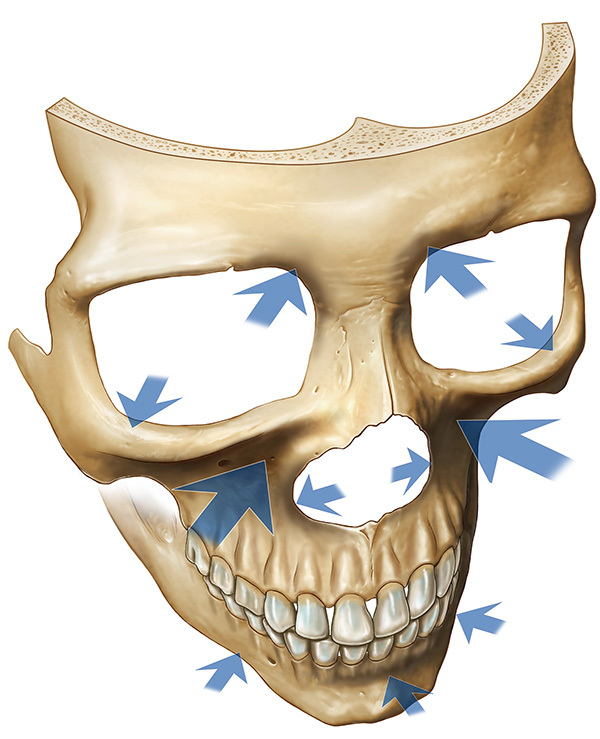 Patients with naturally retruded skeleton therefore will benefit profoundly from augmentation of the facial skeleton. The added projection from the skeletal augmentation adds to the 3 dimensionality of the facial features and add depth and character to the facial features. We now know that the facial skeleton changes profoundly with aging. Certain areas of the facial skeleton are susceptible to resorption with age and the resultant loss of soft tissue support here contributes to the sagging that we see with aging. Accordingly, patients with facial aging would also benefit from skeletal augmentation for a more harmonious result with facial rejuvenation. Skeletal augmentation can be done alone or more commonly with the surgical rejuvenation (known as the ‘lift and fill’ approach). Skeletal augmentation can be done with a variety of materials. It can be done with facial implants such as silicone, medpore or more recently hydroxyapatite granules. Hydroxyapatite granules in particular have been gaining popularity recently. It has the same chemical composition as bone and integrates completely with the facial skeleton. It is very safe when used in the face. For a detailed discussion of materials that best suit your needs, please visit us for a detailed consultation.